If you’ve never owned a coffeetable book with bullet holes in the cover, this is the book for you. 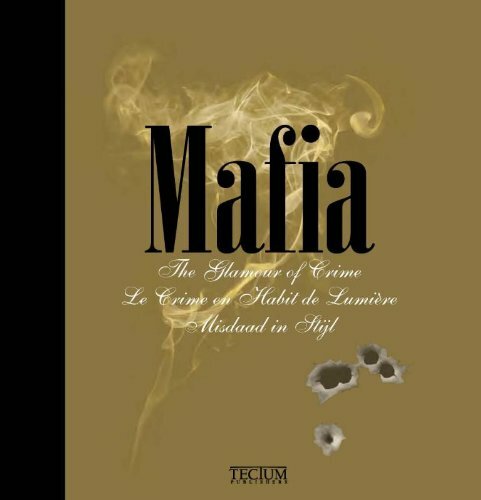 This trilingual (English, French, and Flemish) volume tells you more—and also much less—than you might want to know about international crime and criminals of the organized mobster variety, and tries to show how fashionable it all is and was. This pockmarked tome will certainly provoke conversation among your guests—which is one of the things coffeetable books are supposed to do. The book is also large enough (13.5 x 12 x 1.2 inches) to do the other thing required of coffee table books: cover up the burn marks where Aunt Martha dropped her cigarette 15 years ago. Mafia is never completely sure whether it wants to focus on the make-believe gangsters of the cinema or the vicious real mobsters who left bloodstains and bullet holes in cities around the world. Fantasy wins by a very slight margin. The first clue to the theatrical leaning of the book comes on the inside front cover with a photo of a two-shot derringer, the small, easily hidden pistol favored by cinematic gamblers, along with two cartridges. A quick glance shows the cartridges not to be bullets of the kind that might make holes in people or book covers, but rather blanks of the type used on stage. Score one point for make-believe. The book is filled with a variety of large, often full page, photos of various evildoers and their deeds. The shots are a mixture of movie stills and news photos. Yet only about half of the pictures are clearly captioned; most of them float in soft, sepia-toned anonimity or drown in oversaturated color, making us guess the who, what, where, and when of them. The real world of crime and its fantasy counterpart often blend, points out Mafia: The Glamour of Crime. Many organized crime figures have modeled themselves after the more romantic and dashing crooks from the silver screen; the way of dressing, the tough guy stances, and even the jargon of the underworld in the movies and on the streets seem to have a chicken-and-egg relationship. Ms. Meynendonckx’s book gives an international view of movie crime and its bloody, reality-based equivalent. Much of the focus is on crime in America and the Hollywood version of same. The word mafia, the author tells us, is a word that can be used to describe a wide range of organized illegalities. He uses the term for gangs around the world. Equal opportunity abounds as we are shown the Italian roots of the cosa nostra, the Jewish background of the kosher nostra, and the Irish gangs that battled both of these groups—and each other. We are then taken on a whirlwind guided tour of the yakuza of Japan, Korea’s kkangpae, China and Hong Kong’s triads, the Russian mafia or vor, la eme inside Mexico’s prisons, and India’s Mumbai mafia. Blood and gore, we learn, are ubiquitous. Mafia fans might enjoy adding this book to their collection. Historians and literary researchers will find little in the volume that hasn’t been said before and better. One value of Mafia: The Glamour of Crime (Le crime en Habit de Lumiere; Misdaad in Stijl) is that it probably costs less than the price of refinishing that ancient cigarette burn on the coffeetable. Martin A. David is a writer and an actor who enjoys playing gangsters.